With a pregnancy fraught with complications (gestational diabetes and a blood clotting disorder), my OB uttered the dreaded “I” word pretty early. Have you ever Googled induction? It’s a smorgasbord of horror stories of 4 day long labors, emergency c-sections, NICU time for babies – especially for first time moms. You would think that no one had ever had a positive induction experience. Well, I’m here to tell you that I thought my induction went pretty darn well and to tell you my story. I’m letting it all hang out here, so if you’re squeamish about the whole birthing process, or very long narratives, you may want to skip this one! It was decided by myself and my OB that we would induce me right before 39 weeks (38 weeks, 5 days to be exact). Before my induction, my cervix was 80% effaced (thinned out) and soft, but not dilated at all. So, I would go to the hospital the night before my official induction date for them to place Cervidil, which is like a medicated tampon, against my cervix. The hope was that the Cervidil would prime my cervix even more, and hopefully dilate me a bit before starting Pitocin in the morning. On the day I went into the hospital, I didn’t feel nervous. I went to a late lunch with my Mom and husband and felt pretty calm. Ready to not be pregnant anymore. I wasn’t even nervous checking into the hospital. But, once I got into my room, it got real. I changed into my gown and I refused to sit on the bed while we were waiting for the nurse. Like, as long as I wasn’t in the bed, I could just keep being pregnant for a while. Which, I totally didn’t want but all of a sudden I was more afraid of the whole giving birth part! The nurse came in and I reluctantly got into the bed. We talked about how the evening was going to go, hooked me up to the monitors, and attempted to insert my IV. She was having trouble finding a good spot – apparently my veins like to hide – and brought in another nurse to do it. The insertion went fine, but they placed it right where I would bend my wrist on top of my hand, so it was a little uncomfortable sometimes. But, no biggie. Soon afterwards, the doctor came in to do a cervical check and insert the Cervidil. Now, I’ll be the first to admit that I’m a wimp about pain, but the insertion of the Cervidil was quite painful for me. But, cervical checks were always painful too, and I know some ladies can do those just fine. So, if you’re comfortable with cervical checks, I would guess that Cervidil insertion would be a piece of cake for you! Luckily, it only took a minute. But, I was weird and squirmy the whole time, despite my best efforts, and I was apologizing for being weird and the doctor was apologizing for the discomfort and everyone was just sorry for the experience! Once the Cervidil was in, I didn’t feel much – I couldn’t really tell that it was there. I was required to stay in my bed for an hour to make sure I (or baby) didn’t have a weird reaction to the medication. After that, I could get up and go to the bathroom and even have dinner (I’ve heard that some hospitals won’t allow you to eat once you’re admitted, but mine let me eat until midnight). So, I ate and hubby and I watched some TV until I was ready to go to sleep. They offered me a sleeping pill (Ambien), but I was kind of nervous to take it, since I had never taken a sleeping pill before. My mom, a former RN, recommended that I take it, so I did. Unfortunately, for me, it didn’t do a thing! The rest of the evening is kind of a blur. I started having what I later realized were contractions, along with terrible back pain. I woke up my husband and made him rub my back. I couldn’t get comfortable and kept messing up the fetal monitor on my belly by tossing and turning, so the nurse had to come in every 30-45 minutes to fix it. I tried, but just couldn’t stay still! I had heard of mild cramping with Cervidil, so I remember thinking, if this is just super easy contractions, how am I going to do this!? I found out later, based on the contraction monitor, my contractions during that night were just as strong as my contractions in “active labor” while on Pitocin, so that made me feel like not such a total baby! Around 5am, the nurse came in and removed the Cervidil (another ouch!). I had to lay still for 10 minutes before I could get up and they may have been the longest 10 minutes of my life! My back was killing me. Finally, I got the ok to get up and take a shower. I felt much better after that! And, once the Cervidil was out, my contractions weren’t as strong or painful. So, after a rough night, I was READY for my epidural. My stance on the epidural before labor was “Yes, please” and ASAP. I had asked the doctor the evening before about when I could get it, and he said that I could have it anytime I wanted – they wouldn’t make me wait until I was so-many centimeters along. Shortly after my shower, the nurse started Pitocin and I asked about the epidural. She said I could have it anytime, but that it would be about an hour from the time I ask until I could receive it though, since they had to give me a certain amount of fluids through my IV before they call the anesthesiologist. Plus, I knew there were SEVEN ladies being induced that day and I didn’t want to be last in line for the epidural! I sheepishly looked at my husband, thinking that I was a big whiny baby for wanting it so early. But, I said the heck with it, and said I wanted it. She started the fluids. About this time, there was a shift change, and I got the nicest nurse EVER. I wish she had been my nurse through my entire labor! Never underestimate the power of an amazing nurse. After the fluids were done, the nurse called the anesthesiologist and he arrived pretty quickly. I still felt weird about it, since I wasn’t in any substantial pain at this point – nothing like the evening before! But, I knew that the Pitocin would be increased and I would definitely want pain relief before the rough contractions started! Now, I know some ladies are nervous about the epidural. Honestly, I thought it was a piece of cake. The initial stick of the numbing needle did hurt a bit, but it only lasts a couple seconds and then I didn’t feel a thing. The placement was quick and easy. I was ready to be numb! The nurse kept asking me if I could feel certain sensations on my legs (wet/cold) and I was feeling everything. One of my legs felt slightly tingly, but that was it. I had a little panic moment – what if I was one of those women that the epidural just failed? How was I going to do this without my highly anticipated epidural!? After 45 minutes, it was clear that the epidural just wasn’t working. The nurse was super reassuring and called the anesthesiologist. He came back and said that he wouldn’t recommend readjusting it, since, in his experience, it usually didn’t solve the problem. Instead, he decided to start all over again. For some reason, maybe because I already expected it, the stick of the numbing needle hurt even less. And…that epidural started working right away! Ladies – I’m here to tell you how AWESOME and WEIRD the epidural is. I expected to be totally numb from the waist down. Nope. I could feel when someone was touching me, but I couldn’t feel cold/wet sensations or pain. I kept telling my husband to pinch my leg because I couldn’t feel it! I did get the shakes, a common reaction to the epidural, but it didn’t bother me at all and I didn’t feel cold. Finally, with the epidural in place, the doctor (another one from my same practice) came in to check my progress and break my water. I was 2 centimeters dilated – woohoo! And, the cervical check didn’t hurt in the slightest with the epidural. Then, she broke my water and the nurse got my catheter in place. Again, no pain at all. Now, it was just time to wait and relax. The rest of the afternoon/early evening was spent talking to my mom and husband, light napping, eating sugar-free popsicles (due to my gestational diabetes), and keeping myself occupied. Around 4pm, the doctor came in again to check my progress. I was 9 centimeters! Honestly, I was shocked. I was laughing and joking around with my family and my body was actually doing something productive that should feel like the worst pain ever!? Again, that epidural is amazeballs. At 4:30pm, things got real. It was time to push. Two nurses came in and got my bed in the right position, helped me hold my legs, and told me when I was having a contraction so I could push. I pushed. And, pushed. And, pushed some more. 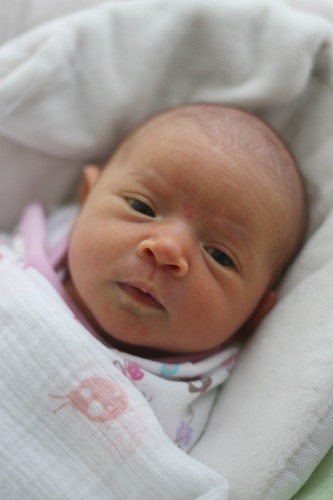 “A Baby Story” lied to me – I thought I could push my girl out in 10 pushes or less. Ha! Definitely not. With the two nurses and my mom and husband assisting, I pushed as hard as I could for an hour, making slow progress. At one point, the nurse decided to turn down my epidural medication – I think that was the incentive I needed to get this baby out ASAP! For the record, I never felt ANY pain during pushing or birth. I could feel the pressure of the baby moving down, but no pain at all. My doctor came in for the last 10 minutes or so. I kept pushing and then everyone yelled at me to stop – my girl was almost here! Her head had been in a weird position and she had finally turned it and my last push almost pushed her out before the doctor was ready! Everyone got on their splash gear (birth is messy business) and with one final push, our little girl arrived! The damage? A second degree tear. The doctor stitched me up while I held my baby girl and I never felt a thing. In short – I was at the hospital for about 24 hours before she was born, including the overnight with Cervidil. I had painful contractions for a couple hours, but then got a fabulous epidural. Our girl’s heart rate during labor was great, so no scary moments there. And, I ended up with a vaginal birth. Not bad for an induction before 39 weeks for a first time mom with no dilation ahead of time! So, there is my very long-winded, thorough induction story. It can be a scary proposition, but there ARE positive induction stories out there!